At Cleveland Clinic Indian River Hospital, we practice a holistic approach to healing and believe meeting the spiritual needs of our patients is an integral part of the healing process. Pastoral care at the Hospital reflects the hospital’s approach to healing the whole person – physically, emotionally and spiritually. We understand hospitalization can be a frightening and traumatic experience. The Pastoral Care department is part of the healthcare team and available to help – particularly with understanding the meaning of what is happening. Visitations to parishioners by their own clergy are always welcome and encouraged; please be sure to let your faith community know if you would like a visit by your own clergy. However, for those patients who are not affiliated with a specific church, Cleveland Clinic Indian River Hospital offers pastoral care services. Members of the pastoral care service visit on a referral basis only, so please call the office or ask the nurse or doctor to call for you and a chaplain will respond to your needs as quickly as possible. Supportive services, both religious and non-religious, are available to meet your needs. Contact the chaplain at (772) 567-4311, ext. 1124 for a routine visit or ask the staff to contact the chaplain on-call for an urgent or emergent visit. To help patients and their families during times of stress and change, the Hospital offers a program supported by local clergy who volunteer their services and assist the Hospital Chaplain. The program is a crisis service available to all patients, family members and staff, regardless of their faith affiliation. Volunteer chaplains, who are ordained clergy, deal with issues ranging from anger, depression, loneliness and anxiety to death and dying. The pastoral care team, composed of clergy representing a myriad of faiths, emphasizes that visits to patients are of a non-denominational nature. The volunteer chaplains visit on behalf of the hospital, not their church or congregation. The Volunteer Chaplain program involves a lot of listening and picking up on what the patient’s or family members’ needs are, and in some cases, just being a quiet spiritual presence. Patients set the boundaries and the pace for any spiritual care that is offered. The Post Chapel at Cleveland Clinic Indian River Hospital was born out of unselfish love and everlasting vision for the community of Vero Beach. Upon entering its doors, the symbols of life await the visitor through a composite of exquisite stained glass panels encompassing the heart of the structure. The Post Chapel and Meditation Garden at the Hospital provide a beautiful and serene setting for people to reflect, meditate and pray. The chapel and garden were a gift from Richard and Helen Post in 1996. The Post Chapel is a non-denominational, intergenerational haven designed to satisfy the spiritual needs of patients and their loved ones. It offers a quiet place for prayer and solace. The comfortable interior furnishings of upholstered benches, accent lighting and decorative accessories have been carefully selected to complement the stained glass windows. Each of the sixteen windows and sixteen etched glass door panels tells a story of God’s creation, youth, maturity, praise, prayer, visiting, and caring for the sick, love, hope, peace and reward in heaven. All have been gifted, in honor or in memory, by an individual, a family or a group. The Hospital, as well as the benefactors of the Post Chapel, desire to open its doors for everyone who has the need for prayer and solace. 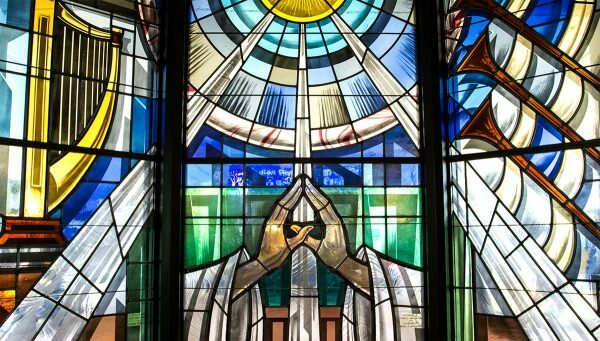 Hospital staff, patients and their families are encouraged to visit the chapel when in need. Taking a few quiet moments can help restore a sense of inner strength and peace. The Post Chapel is located across from the main entrance to the hospital and offers handicapped access. It is open from 7 a.m. to 9 p.m., seven days a week, or any other time by calling the hospital operator who will have the security department open it after hours. The adjacent garden is accessible around the clock. There is a brief interfaith prayer service in the Post Chapel held monthly at 11:30 a.m. on the last Tuesday of each month hosted by the various faith communities; all are welcome to attend. Community clergy may register to obtain access to the Daily Census Report to obtain the room number of your congregant prior to visiting. Only one (1) senior clergy member may register from each faith community.